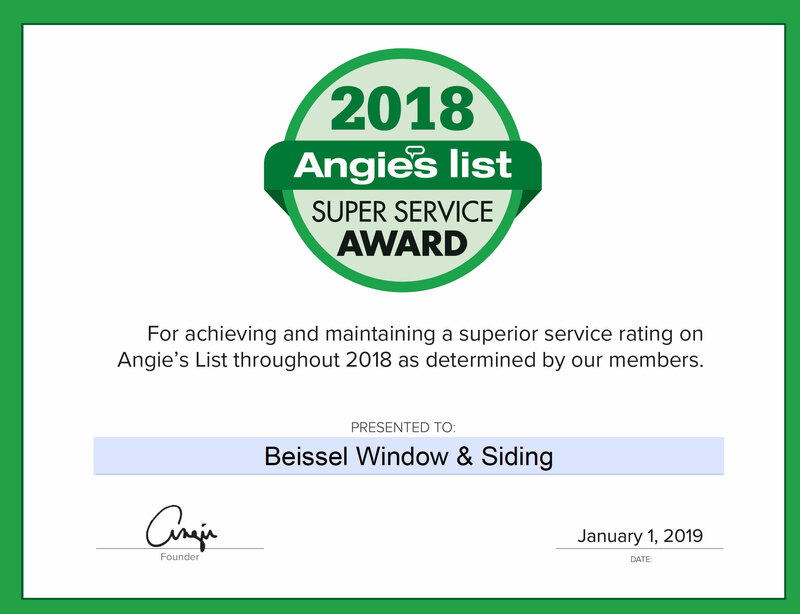 Beissel Window & Siding is proud to announce that it has earned the home service industry’s coveted Angie’s List Super Service Award (SSA). This award honors service professionals who have maintained exceptional service ratings and reviews on Angie’s List in 2018. Family owned & operated since 1950. Angie’s List Super Service Award recipient every year since 2003 (20 ) total category awards. We have long term, experienced staff and offer extensive product lines and showrooms with designers on duty. Evening and weekends available by appointment. Long term labor warranties. Award winning. Additional DBAs – Accent Design & Renovation LLC, Beissel Renovation, John Beissel, Inc., Beissel John Inc., General Home Improvement Company.